These Cranberry Bliss Rice Krispie Treats are a modified knockoff of the Starbuck’s favorite Cranberry Bliss Bar. So good I think Starbucks should take notice! I’m flipflopping again! I’m hosting a party tonight so I’ll get some photos of guests sipping on a new cocktail I had originally planned today for Friday Cocktails and I’ll publish it this weekend. In the meantime you can enjoy these beauties; it’s all I can do to keep my hands off of them and save them for guests! I’ll be perfectly honest. I’m not sure I’ve ever had a Cranberry Bliss Bar at Starbucks. I know…crazy right? It’s not that I’m not tempted by the description and their combining of cranberries with a white chocolate bar that’s topped with a white chocolate glaze and cranberries; no, it sounds divine. But I have a problem. I simply cannot pay Starbucks $3-4 for a small treat when I’ve always got something at home to satisfy my sweet tooth. Color me cheap if you must; I prefer saying I’m frugal! But that doesn’t mean they didn’t come to mind when I had one of my famous (or maybe infamous) pantry inspirations. I had used dried cranberries in a salad the other day; I popped them down on the counter with other things that I had picked up at the market that needed to be stored in the pantry and voila…it happened. It was as if it was destiny when the cranberries ended up next to a bag of white chocolate chips and marshmallows, don’t you think? As a rule I love making pretty desserts; for me it’s fun to spend half a day making a beautiful creation to wow friends and family. But I have this thing for Rice Krispie Treats. I just love them. So I fiddle with them a lot. I’ve recreated a fantastic dessert from my hometown that’s actually sold on a stick there, I’ve gone the S’Mores route and I make a peanut butter and chocolate version that makes a Reese’s Peanut Butter Cup seem mundane (I’ll list them all below before the recipe). So this would surprise no one who knows me that I’ve done it again and I must say, I’ve done good! I’m betting once you try these your Starbucks habit will disappear and you’ll be making them at home too. I won’t tell your family if the edges get trimmed a lot…just enjoy! As promised; here’s a bunch more of my Rice Krispie Treat creations…I love them ALL! Butter the inside of a 9X13" pan. 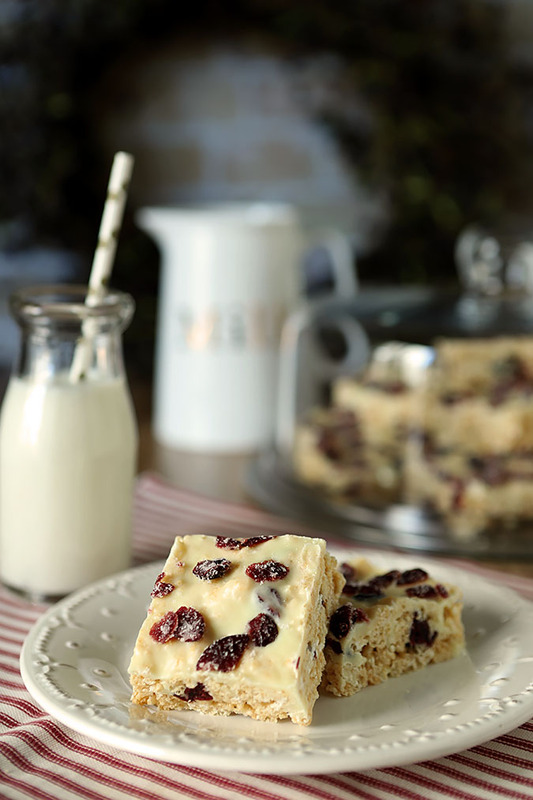 Combine the cereal, dried cranberries and white chocolate chips in a large bowl and set aside. Melt the butter in a large pot over medium heat. Add the marshmallows and continue to cook, stirring often, until they are melted and combined with the butter. Turn off the heat. Add the cereal mixture and stir until everything is combined; pour into the buttered pan and pat evenly. Combine the white chocolate chips and milk in a measuring cup and heat in microwave on low heat for 30 second increments; stirring after each time period. Continue to do this until all of the white chocolate is melted and the mixture is pourable. 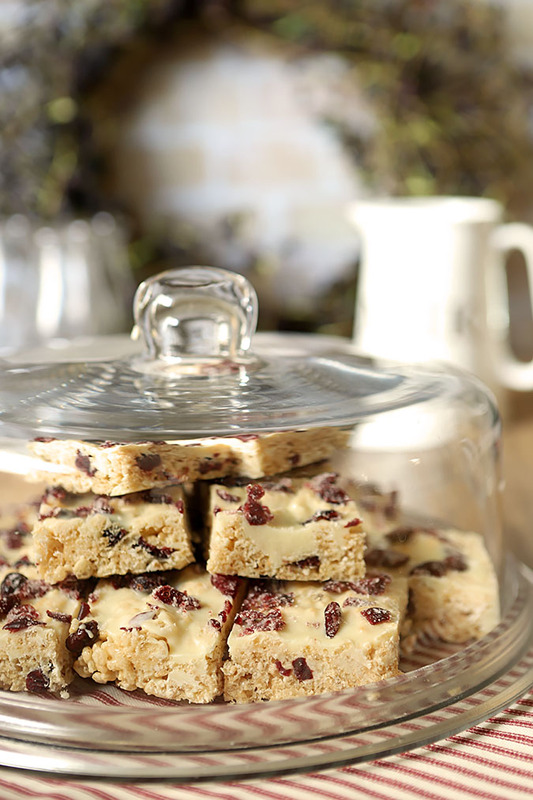 Pour over the Rice Krispie Treats and spread with a spatula; sprinkle the dried cranberries over the top. Allow to cool completely and then cut into squares. Cutting dry cranberries can be a pain; they're a lot like dates and can just stick to your knife and each other. So I add some granulated sugar to them on the cutting board which makes it so much easier. Keep rotating them in the sugar as you cut and sticking will be minimum. Great news so excited to make these. They look so delicious. I made them for a party last night; especially for my friend who has to avoid gluten. She admitted later that she might have had 4 or 5 of them…to me that’s success so I hope you enjoy them too! Sigh. So YOU get to try your cocktail tonight, but we don’t? 😀 I’ll be patient and wait. 🙂 And these goodies will definitely keep me occupied while I wait — lovely flavor combo. Good stuff — thanks. I’m not sure I’ve ever bailed on a promise but I was so exhausted today I bailed on everything. But do not fear…if not tomorrow than Monday; this one is too good to miss and I have another for Christmas Eve so…gotta get it done stat! Hi Barb, seems like your instructions and ingredients are missing. Might need to update it, however, from the looks of it, seems like something both Madison and I would enjoy eating. OY VEY! Not sure what happened but it’s fixed now, thanks for the heads up! So what’s the secret to actually seeing the recipe? I see “Ingredients” with gibberish below that and “Directions” with nothing below. Are we supposed to guess? That was my secret code! Or my big mistake? Not sure exactly what happened to just display that text but it’s fixed now; thanks for the heads up!